Although the drop in oil price has led to a fall in operational cost of a vessel, bunker fuel - especially when the more expensive distillate is used in an Emission Control Area (ECA) - remains a significant component of operational cost. Even for heavy fuel oil there is a need to measure density because fuel is bought by weight but delivered by volume. Hence, appointing a bunker surveyor for bunker deliveries is essential in making sure the right quantity is delivered and that the on board quantity of the vessel is measured and calculated in a correct way. Even when a mass flow meter (MFM) is used, quantity differences will continue to exist because the receiving vessel’s quantity is based on manual measurement and calibration whilst the bunker tanker’s delivered quantity will be based on a mass flow meter’s reading. Of course, a surveyor’s role is multifaceted and not confined to just measurement or calibration. With a proper survey conducted by the surveyor, a ship owner or operator will have accurate, real-time data and can take prompt action, if required. At the same time, the surveyor can also help ensure compliance with port regulations on bunkering. After all relevant papers have been filled out and signed, the surveyor will need to focus on all the measurements. He starts with a thorough measurement of all the vessel’s nominated and non-nominated tanks including settling, services and overflow tanks and any tank space(s) related to the bunker receiving system. At the same time he will also take temperatures from all tanks, unless access to a particular tank is not possible, in which case the temperature indication on the vessel’s computer or tank has to be taken. On the bunker tanker the surveyor together with a crew member and a representative from the bunker tanker will measure all nominated and non-nominated bunker tanks and take temperatures from each tank. On both the vessel and bunker tanker, water indicating paste will have to be used for free water detection for distillates fuels unless local regulations require this for all grades. Through proper, accurate measurements, the surveyor plays an important role in preventing the manipulation of bunker quantity. The surveyor, often seen by the chief engineer as a valued helper, will also advise whether the bunker tanker is securely moored so that safe access can be provided from the vessel to the bunker tanker and vice versa, either by lowering a pilot ladder or by gangway. In some cases, a safety basket can also be used. The surveyor will check whether the hoses are in a good condition and whether they are well supported in accordance with relevant international standards, and whether the bunker tanker hose is safely connected with enough bolts. As the bridge in effective communication between the bunker tanker and the vessel, the surveyor may even enable immediate shutdown of bunkering as soon as a problem or danger is detected. Even when a MFM is used, the surveyor’s role is critical because the vessel may be short-handed, and the crew overworked and lacking in knowledge of the flow meter technology. As such, they will not be able to monitor or handle a MFM delivery correctly. The surveyor is also responsible for taking representative samples. The objective of the sampling is to get all parties to agree on one common representative sample taken by drip method, preferably at the vessel’s manifold (point of custody transfer) provided a proper sampling device is available. This sample has to be collected and witnessed during the entire bunker operation and should be properly mixed and poured into the bottles when the bunker operation is finished. The bottles have to be labelled, sealed and distributed to all parties concerned. This representative sample will be very important evidence in the event of a bunker dispute. The surveyor also provides an independent third party verification and protection for customers in legal matters. After the bunker operation is completed the surveyor will again check all tanks on both the bunker tanker and the vessel. When all is in order the supplier’s Bunker Delivery Note (BDN) will be signed and the relevant papers distributed to all parties. The Veritas Petroleum Services (VPS) surveyors conduct their survey work according to the BQS Code of Practice. In Singapore the surveyors have to comply with the Singapore Standard Code of Practice for bunkering by bunker barges/tankers (SS600). To ensure strict quality control, audits are regularly carried out by supervisors to find out whether the surveyors are adhering to procedures, using the right equipment and also if the vessel’s crew is “happy” or satisfied with the service provided by the attending surveyor. This sets out the best practice for documentation, equipment requirements and verification of procedures during a bunker operation. Since bunkers are sold by weight but delivered in volume, the presence of a professional bunker surveyor is needed to ensure that the correct quantity is delivered. A experienced surveyor can prevent the supplier from employing “tricks-of-the-trade” to cheat buyers because an investigative remaining-on-board survey entails finding hidden bunkers as well as the investigation of shortages or alleged “cappuccino” during bunkering operations. 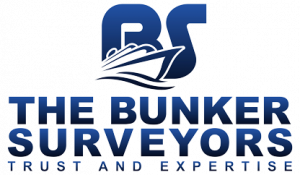 The surveyor will also offer a helping hand with inconsistencies or errors on the BDN and advise the vessel’s staff accordingly and assist in quantity dispute resolution. The attending surveyor has to be experienced, well-trained and adequately equipped with professional and calibrated equipment, including a gauging tape and an electronic thermometer, water and oil indicating paste, a flash-light, sufficient seals, sample bottles, papers and a multi-gas detector for safety. Apart from carrying out Bunker Quantity Survey (BQS) for the fuel quantities and grade(s) that will be bunkered, the surveyor will also advise and help the chief engineer with any safety checklist, custom papers and papers required by the supplier, such as bunker requisition and sample labels.